One of my favorite 30’s movies – a sheer delight. Thief meets thief, they shack up, scheme to fleece rich woman, thief shacks up with her, love triangle ensues, thieves get away together in the end. Bookmarking naughty/cute scenes where the thieves impress each other by showing off the stuff they pickpocketed from each other during whatever they were doing together before the camera turned on. My two favorite people, maybe just out of recognition from The Smiling Lieutenant, were thief Miriam Hopkins (the princess of Flausenthurm) and major Charlie Ruggles (the friend from whom Maurice steals his modern girl). Miriam is really terrific… maybe I’ll check her out in Design for Living, Becky Sharp or Dr. Jekyll and Mr. Hyde sometime. The lead male thief was regular-looking Herbert Marshall (star of Angel and Murder!, later in Angel Face and Duel in the Sun), the duped perfume CEO was dark-haired Kay Francis (of Scandal Sheet and The Cocoanuts), and another duped rich guy who, along with the major, is trying to marry Kay was Lubitsch regular Edward Everett Horton. Great, sophisticated intro scene when the thieves first meet, both pretending to be some fake rich person in order to steal from each other. Actually I think the very first scene was E.E. 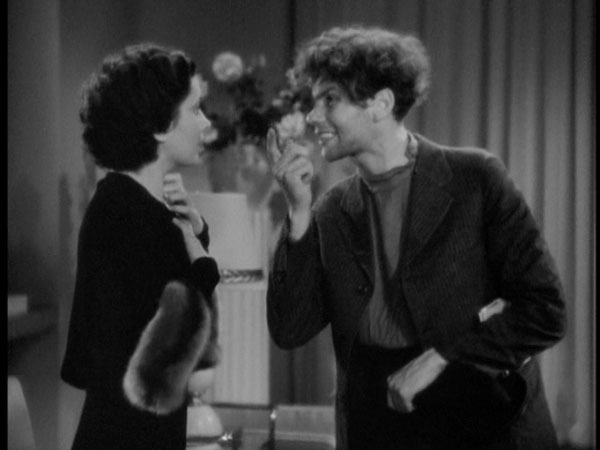 Horton explaining to the cops how he got his wallet stolen by a fake doctor – in the end he publically identifies Marshall, now hired as Kay Francis’ assistant and lover. Miriam Hopkins is hired as a secretary so they’re both inside the house, but only get away with $100k and a pearl necklace instead of the intended $800k+. Most interesting part of the movie was when rich (but goodhearted/generous) Kay is offering a high reward for her missing purse, having the forty-some purse-carrying hopefuls gather in her foyer, receiving them one at a time (each announced by the butler) in an upper-class, highly inefficient manner. A crazy-haired Russian-accented Trotskyite waits his turn, then comes in with no purse just to berate a woman who would spend so much on a purse during the depression, shouting “phooey, phooey and phooey” at her. This is when thief Herbert makes his opportunistic entrance, talking to the “radical” (as labeled in the credits) who then leaves peacefully but still angry. The radical is sort of a comic character, with his wild hair and repeated “phooey”s, but the movie seems careful not to ridicule him, and lets him have the last word, owning up to the fact that our main characters are too extravagant for their own good, voicing some of the resentment that audiences at the time must have felt. The Russian was Leonid Kinskey, who ten years later played one of Rick’s employees at the Café Américain in Casablanca. 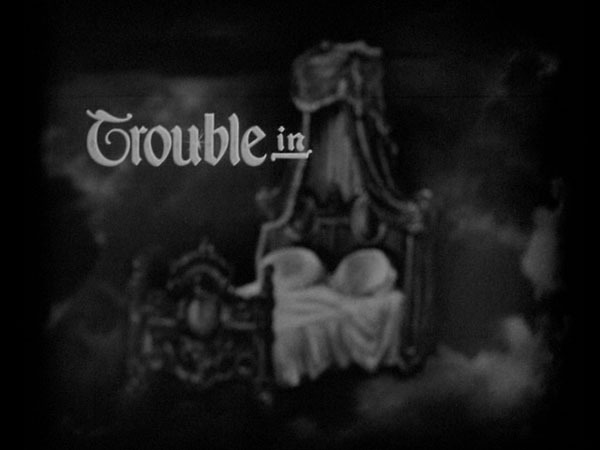 Nice, well-researched audio commentary points out the title card (words displayed progressively over shot of a bed = “Trouble In [Bed]”) and tons more. Beginning of 1930’s Month for Katy and myself starts with a bang. EDIT 2016: Eight years later, Katy does not remember 1930’s Month, nor this movie, so we watched it again.